We are at an interesting juncture in Canada in terms of Indigenous relations. On the one hand there is an awakening and awareness on the part of mainstream Canadians, the media, and governments that is contributing to a landscape of reconciliation. This awareness and awakening is causing many to accept and reconcile, rather than hide from, uncomfortable truths about the history of Canada and how Indigenous Peoples have been treated. It is also generating calls by Indigenous and non-Indigenous Canadians for the removal of tributes to historical figures who were particularly ruthless in their treatment of Indigenous Peoples. On the other hand, there are some Canadians who struggle to make a name for themselves by clinging to and broadcasting their colonial ideals and beliefs. I don’t want to give any airtime to the latter - they simply don’t warrant any attention. What I do want to focus on is the positive, on people who are making a difference, on organizations that are committing to the calls to action of the Truth and Reconciliation Commission of Canada. "To begin, we would like to acknowledge the Mississaugas of New Credit, the Haudenosaunee and the Huron-Wendat, the original keepers of this land for hosting us today and for hosting TIFF on their land every day." For that statement to be made to a national and international audience is a huge advancement in Indigenous relations in Canada, and it sends a positive message to international visitors. CRFAIR promotes healthy and sustainable food systems. This considers our relationships with each other, and the land and waters of this region. We endeavour to honour the land and its treaties by strengthening our relationship and responsibilities to them. We live and work on unceded Coast Salish Territories*, specifically of the Lekwungen (Songhees and Esquimalt Nations) and W̱SÁNEĆ (Tsartlip/W̱JOȽEȽP, Tseycum/WSIḴEM, Tsawout/SȾÁUTW, and Pauquachin/BOḰEĆEN Nations). The presence of settlers (non-Indigenous peoples who live on these lands) is not neutral; it has had and continues to have devastating impacts on many aspects of life for Indigenous peoples. Many of our practices, including the seeds we plant, the ways we educate, and our methods of growing food came to these lands through the ongoing process of colonialism. Settler colonialism has suppressed local well-being by harming Lekwungen and W̱SÁNEĆ food systems, whether they be land-based or of the sky and sea. We hold this understanding in our interactions and engagements with this land and its people. There is important work being done by many nations and allies to ensure the continued thriving of these food systems, communities, and knowledge systems. Those of us who are settlers need to recognize that our knowledge and way of doing things may not be the priority as we work towards food security for everyone in this region. * The term Coast Salish is used to encompass a number of Indigenous peoples, including Esquimalt, Hul’qumi’num, Klahoose, Lekwungen, MALAXEt, Musqueam, OStlq’emeylem, Pentlatch, Scia’new (Beecher Bay), Sliammon, Shishalh, Skxwú7mesh-ulh Úxwumixw, Stó:lo, Straits, Tsleil-Waututh, T’Sou-ke, W̱SÁNEĆ, and Xwemalhkwu. The act of including that statement on the website is both encouraging and inspiring. Other ways to acknowledge whose territory you are on is to add it to your business card and include it in the signature block in your email. My hope is that by doing so we will inspire others to do the same and it eventually will encompass all who consider reconciliation an essential part of everyday life. 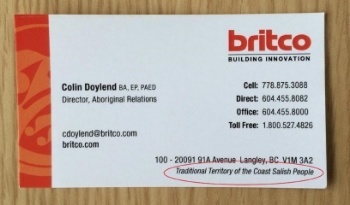 President Indigenous Corporate Training Inc. I feel a groundswell of change happening in Canada and it’s exciting. There are some who feel it’s not changing fast enough and others who think the change is too much or shouldn’t be happening at all. For the record, I’m here to support the readers, who like myself, feel that taking action, whether small or large, will send the signals of change required to change the world. Here's an article with some resources to help you with your research on whose traditional or treaty lands you are on. If you are interested in learning more about Indigenous protocol and why it's important, consider taking one or more of our courses. Click the image below to learn where our upcoming Training Weeks will be held.